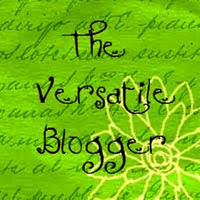 Last week Shannara Letted me know that she tagged me with this Versatile Blogger Award! Thanks Shannara, check out her blog Nails And Stuff, she makes some nice manicures! - I don't understand how I can combine working as a nailstylist, blog every day, go to school every day and make homework everyday, prepare lessons for the childrens in my class once a week etc. But well it works out for me. - I'm a it clumsy, I always fall down. Once I tripped over a stick and tore my ankle. - I make a new nailart every week, which means that once a week I make a lot of swatches and pictures so I can blog the rest of the week :). Sunday's are my nailart days, except when I'm having it to busy with school or something like that. - My sister and mom still have their gelnails! I'm so proud that they still have their gelnails since March this year! I made some nice nailart designs on them so stay tuned, I will show you them! - I'm having a really hard time thinking about this list of 7 things about me.. I'm stuck at number 6 as you can see. It's hard to say things about myself! - Alright, the last one. I hate public transport, but unfortunately I have to go to school 4 days a week with a train, I just hate it! Luckily the last day of the week I'm at a school next to my own house :)! I'm not passing this onto 15 others, I will just pick some blogs out, I don't have the time to look for 15 bloggers, but If you want to do this tag too. Just consider yourself as tagged ;)! Dank je wel, Sylvia... Voor het taggen! Ik heb deze onlangs al ingevuld, maar ik zal hem zeker op mijn blogje vermelden! Leuk om wat meer over je te lezen!